The Big Picture: A net increase of 3 women were added to the CEOs among Fortune 1000 firms in 2009, bringing the total to 28 women in leadership at top firms, nationwide. New names are highlighted in red in the table below: nine new names were added over the past year, with five departures (or changes). 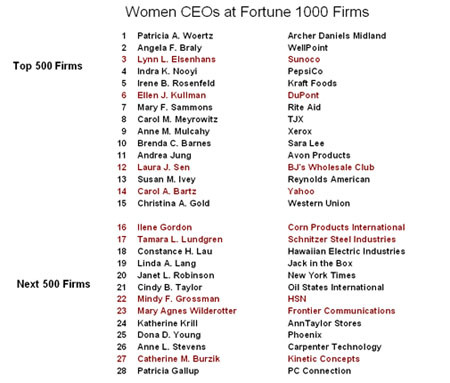 The History: In the year 2000, there were "only" 2 women CEOs on the top tier, Fortune 500 firms, and two years later there were 6 women CEOs. Not too shabby. 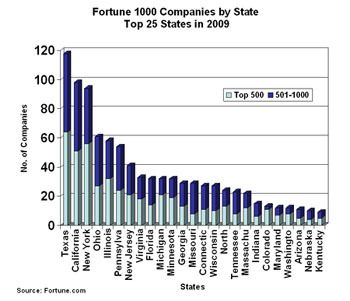 The top 25 states (left chart, below) represent a significant concentration of Fortune 1000 firms. The next 25 states (right chart) are dwarfed in comparison. 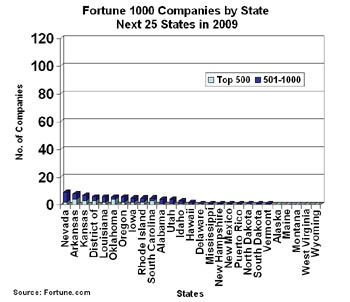 Among the top states, about one-third of the companies are located in just 3 states (Texas, California, and New York). About half of the companies are located in the top 7 states, while ninety percent of the companies are located in just 18 states. 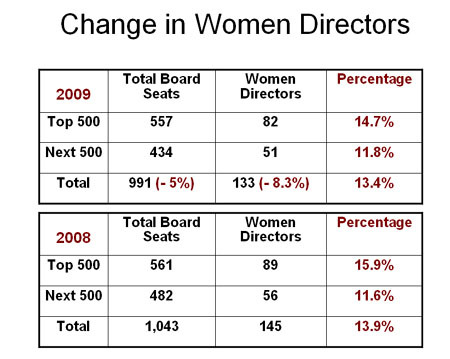 Directors: Overall and Women Compared to last year, the total number of board seats continued to decline by about 5% (or 52 seats). The number of women in director roles also declined by a much smaller number (12 seats, or 8.3%). This means that women represent 14.7% of the board headcount overall. Note: Date is from the online version of Fortune.com in addition to proxy statements submitted to the SEC or corporate web site information.